The Oasis legend told Radio X's Johnny Vaughan whether he's booked for the festival this year. Liam Gallagher has responded to rumours that he'll be appearing at Glastonbury 2017. When asked by Radio X if he was headed to the Somerset festival this year, the rocker was rather vague, saying: "Erm, I'm not sure man." He added: "I mean, I'd like to. Yeah, if they ask us, yeah I'll play it." Meanwhile, rumours have circulated that Oasis could be set to reunite for the One Love Manchester concert this weekend - which tickets have sold out for today in minutes. 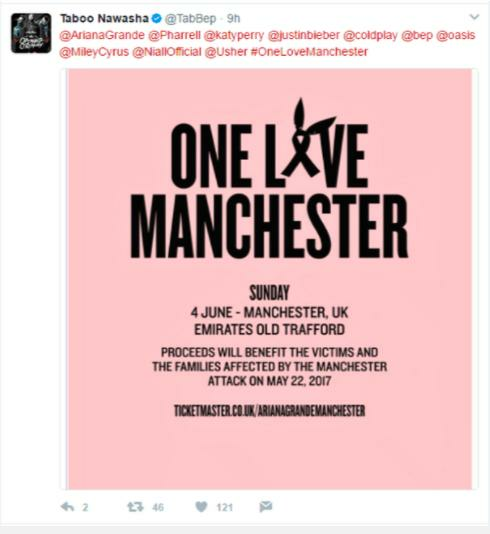 Black Eyed Peas star, Taboo - whose real name is Jaime Luis Gomez - caused havoc by sharing a picture of the event on Twitter and tagging all the acts expecting to perform. However, when asked how he feels to be solo, Gallagher's response suggested there was still no chance of getting the band back together. This week saw Liam launch his solo career with the unveiling of his debut single Wall Of Glass last night and play his first solo gig at the O2 Ritz Manchester on Tuesday. “Yeah I prefer being in a band, he told Johnny Vaughan. I mean I’d prefer to be in Oasis, without a doubt. Liam Gallagher plays his second solo show tonight at Electric Brixton. Wall Of Glass is available to download now.